"Wretched Zionists, whom do you dominate? The miserable Arabs?" One of the Six-Day War’s most famous landmarks, Ammunition Hill, was vandalized early Monday morning. This is the fourth related incident in less than a week, just days before Israel marks its Memorial Day for Fallen Soldiers and Victims of Terrorism. Between 1949 and 1967, while Jerusalem was divided between Israel and Jordan, there was an Israeli enclave about a mile to the east of the border, in the Jordanian part of town. This was Mount Scopus, with the campus of the Hebrew university and Haddassh hospital. There was an agreement whereby every two weeks 200 Israelis would cross Jordanian territory to the enclave, and sit there until the next group replaced them two weeks later. On the night between June 5th and 6th 1967 the paratroopers, backed by a few tanks, made their attack, directly on the Jordanian fortifications. The section of the battle on Ammunition Hill raged from about 2am to 5:30, early next morning. It was face to face combat, between the best forces each side had. 71 Jordanians were killed, and 35 Israelis: most of the defenders died, as did a quarter of the attackers. A story I heard not long afterward told that in the early morning the IDF troops gathered the fallen Jordanians into a pit and covered it, with a makeshift sign that read “Here lie 71 brave Jordanian soldiers”. A few hours later the paratroopers were at the Kotel. The perpetrators of the vandalism could have been anti-Zionist Haredim, Arabs or left-wing extremists. Judging by the content of the literate Hebrew graffiti, my guess is that in this case they are the former. It is simply impossible for me to imagine what would motivate Israeli Jews to desecrate a monument to men who died defending the Jewish state that protects and, in many cases, feeds them. I would like to see the vandals, who spit on Jewish sovereignty, banished to a place where it doesn’t exist. They have made their statement, let them live by it. This entry was posted on Monday, April 23rd, 2012 at 1:38 pm and is filed under General. You can follow any responses to this entry through the RSS 2.0 feed. Both comments and pings are currently closed. I wouldn’t be quick to conclude that Israeli Jews did this. 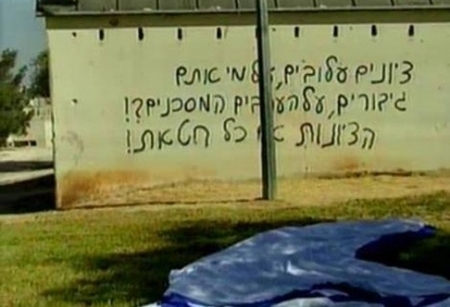 I’m sure plenty of Israeli Arabs can write in Hebrew. They would do this to make people think Jews did this, just for propaganda impact. There are radical Jewish anti-Semites in Israel. They are not behind the vandalism but they do support anything Arabs do to undermine Israeli sovereignty. And plenty of Arabs speak and write Hebrew who have a motive for committing anti-Israel acts. I agree that the ‘message’ given fits in more with the line taken by anti- Israel Haredim though of course one cannot know for certain now when the violators are still at large.